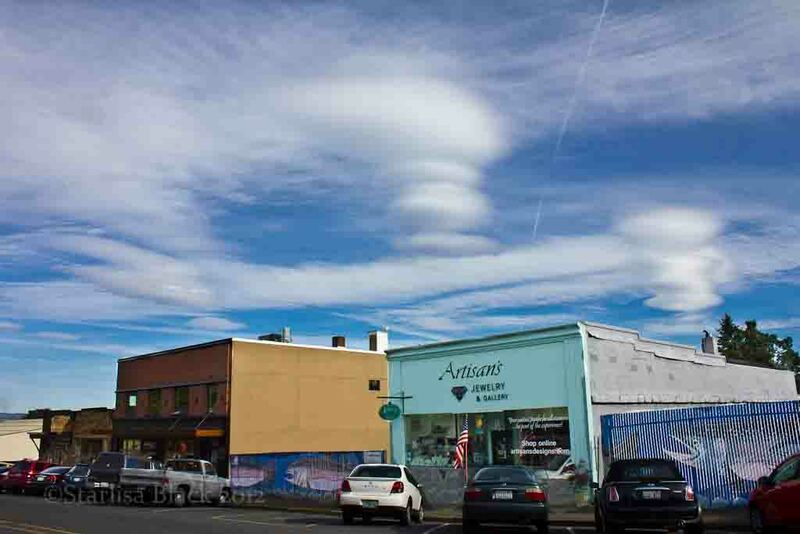 Photography can be as poetic and compelling as the work of the written masters, and we are lucky to have such a visual poet here in the Northwest--one who specializes in the most dramatic type of local clouds: lenticular or mountain wave clouds. Her name is Darlisa Black and on occasion I have shown her work on this blog and in my book. She has a way with light and shadow that I really appreciate, as well as the occasional watery reflection of dramatic cloud features. Lenticular clouds are particularly good photographic subjects, with both subtle, beautiful, and other-wordly features. It is startling to see such weather extremes so close together. Here in the Northwest we are experiencing wetter and colder than normal conditions on most days, with some locations shivering under daily low temperature records. 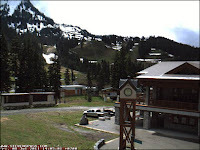 Yesterday, temperatures plummeted to 37 at Shelton, 39 in Olympia, and 38 at Yakima. In some cold hollows near the surface temperatures may have dropped close to freezing. In late June. 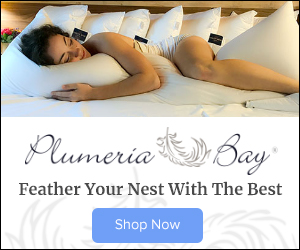 At the same time, temperatures in Colorado have reached over 100F day after day, some all-time high temperature records have been reached, extreme drought is in place, and fires are descending the Front Range of the Rockies into populated areas. In contrast, here are where the high maximum temperature records occurred--from Wyoming through, Colorado, Oklahoma, to Louisiana on the same day. These extraordinary warm anomalies are occurring in locations where precipitation has been nearly absent all spring. Here are the precipitation anomalies for the last month...large areas have had 5% or less of normal precipitation. No wonder wildfires started so early. And yes, WE have had wet anomalies...with eastern Washington being particularly wet. I wonder what that implies for agricultural interests there. But I know what you really want to know, how does July 4th look? Will this abysmal pattern ruin our fireworks and barbecues? Here is the answer from the latest European Center model run. The panel on the right is the average of their ensemble (many model run) system and one on the right is their best single prediction, both for the upper level flow (500hPa). The SAME pattern is there-troughs over the coast, big ridge over the central U.S.
At least we won't have to worry about wildfires, air conditioning, or firework cancellations. Just mold and mildew. There are few more important questions for Northwest hikers: when will their favorite trails melt out and the hiking season begin in earnest? And few more important questions for those concerned about the local impacta of global warming: is the Cascade snowpack melting out earlier, thus providing evidence of the effects of increasing greenhouse gases in the atmosphere. This truth may surprise some and depress others. It turns out that the Cascade snowpack has been trending to melt out LATER during the past thirty years, with the last few years being particularly late. 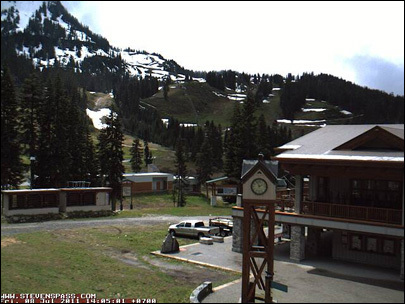 For example, Stevens Pass finally melted out yesterday--3 weeks later than normal. Here is a plot of the melt-out date at Stevens Pass from 1981 through this year (courtesy of UW atmospheric scientist Mark Albright). The y axis shows the melt-out day (days into the year) and the purple line shows a 5-year running average. The overall trend is clearly for a later melt out. 1 July 2011 THE LATEST! Paralleling the late snowpack melt-out is the April 1 snowpack amount, which has not shown any decline over the past 30 years. 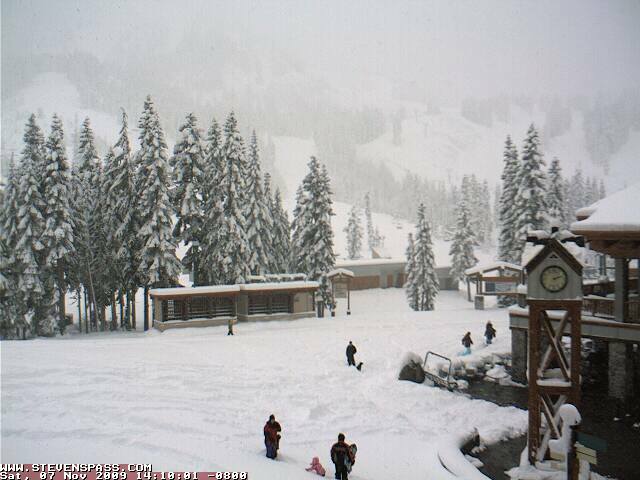 Does this trend in snow melt out mean that the Northwest does not have to worry about greenhouse warming? The answer is no. 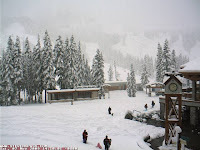 By the middle of this century the Northwest snowpack should clearly be on decline as the earth warms, but as I have mentioned many times in this blog, the entire world will not warm at the same rate. Downstream of the eastern Pacific, the coastal portions of the Pacific Northwest (Cascade crest westward) will warm up more slowly than most places, since the eastern Pacific will take its time to heat up. Let me illustrate this. Here is the change in global temperature from 1980 through this year for the winter months (courtesy of Goddard Institute for Space Studies). The eastern Pacific has COOLED, and we have cooled with it. But we are the exceptions...most of the earth has warmed and the arctic region has really warmed. So there is global warming (with some contribution from man-caused increasing greenhouse gases), but out neighborhood has cooled...temporarily. 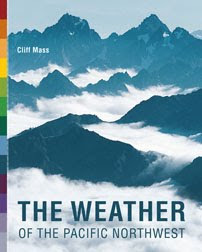 Pretty interesting stuff and with important implications for us here in the NW...we have much more time than most to prepare for the effects of global warming.....at least the temperature/snow part of the changes. So if someone tries to tell you that the coastal NW has already experienced major effects due to global warming, you might question their information. And if someone says that a stable or increasing snowpack the past few decades proves global warming is nonsense...I would not trust their information either. Yesterday (Saturday) the area experienced an event more common to the eastern U.S.: a summer convective squall. 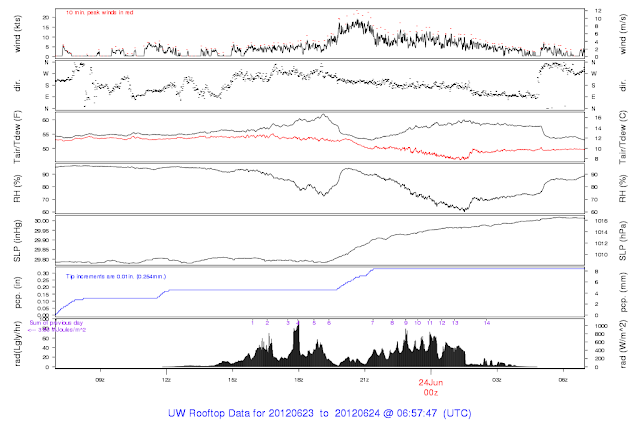 Forced by an short-wave trough aloft that was moving northward, the action occurred around noon to 3 PM, as the fast moving line of convection brought heavy rain, lightning/thunder to some, and winds gusting up to around 40 mph on the east side of Puget Sound. Roughly 10,000 customers lost power, including 6,000 customers in Mukilteo, Monroe and Granite Falls served by Snohomish County PUD and a number of trees were downed including one on I5 (see picture above). The raindrops was far bigger than normal, a sign of the convective origin of the rain...and the top of the thunderstorms exceeded 25,000 ft...very high for western WA but wimpy back east. Here is the radar sequence, and keep in mind the red indicates POURING rain or hail. At 12:09 PM, the squall line was evident...see the line of red colors. My gutters were overflowing at that time! 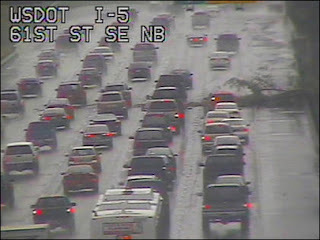 The line was more intense east of Puget Sound. At 1:21 PM, the squall line had moved north of Everett, with moderate precipitation behind. At 2:35 PM it was the turn of Bellingham and vicinity, while the rain was over in Seattle. This band extended across the Cascades into eastern Washington. You can see that by following a sequence of images showing the lightning at 11:30 AM, 1 PM, AND 3 PM. The lightning was pretty much limited to the eastern portion of western WA, the Cascades, and eastern WA. Here is what happened when the line passed the UW (where it was only of moderate strength). 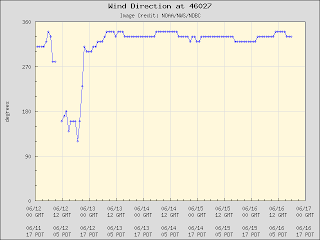 Winds gusted to 25 knots (around 30 mph), precipitation picked up, temperature fell from the low 60s to the low 50s, and pressure abruptly increased and then steadily rose after that. Although the forecast was for showers yesterday, the strength and timing of this particular feature was not well forecast...which is not surprising. Here is the UW model precipitation forecasts for Saturday (staring 5 AM Saturday morning)--it thought a fairly strong line would occurred...but the timing was hours too late. Looks like most of the precipitation has shifted south towards Portland and southwest Washington---their turn. The model predict that precipitation will move north later today, so if you are in Tacoma northward, NOW is good time to get outside. Sunday looks better. For those interested in the amounts of precipitation we have received, here is the 24 h amounts (ending 7 AM) from the cocorahs (volunteer) network. You can see the band of high precipitation values (orange color) that stretched from Issaquah, through north Seattle, towards NW WA. Or if you prefer, the precipitation shown on the NWS site. AIRPORT YESTERDAY. THIS BREAKS THE OLD RECORD OF 0.46 SET IN 1993. YESTERDAY. THIS BREAKS THE OLD RECORD OF 0.46 SET IN 2005. For some reason this did not get to the national records site at NCDC. It was quite wet today over much of western Washington as a SE-NW band of precipitation set up residence across the region for hours. Major contrasts too: from over 1.5 inches to a few hundredths. Take a look at the precipitation map for the 24h ending 9 PM. The dark green indicate more than an inch, while the whites are less than .1. 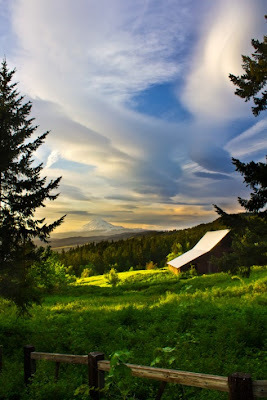 Amazing gradients...a few tenths in eastern WA. Huge variation across the Sound ranging from 1-1.5 over the eastside to a few tenths over Kitsap...not the normal situation! Even less on the coast. The highest I spotted was 1.73 inches at Woods Creek NE of Monroe. The yellows are moderate to heavy rain. The origin of the precipitation was a very strong low off our coast that caused persistent southerly and southeasterly flow over our region--with bands of clouds and precipitation rotating around it...here is the upper level flow late this afternoon...the low is very strong for this time of the year. This feature is not moving anywhere fast. This is a VERY unusual situation. Here is the 500 hPa forecast for tomorrow (solid lines) and what is known as the standardized anomaly....in standard deviations. You see we are at least out four standard deviations...this pattern occurs only once in 15,787 times...very, very rare. Here is a satellite picture showing you the moisture rotation around the low. You can see the bands caught up in the flow..mainly on the eastern side of the low where there is upward motion. These are very hard situations to forecast well...yes, we knew it was going to rain, but correctly defining and timing these bands is extremely difficult more than 6 hours ahead of time. One day. Looks like a another band will swing through later tonight....well, at least you don't have to water your garden this weekend. Coal Train Help: As I mentioned in a previous blog, a group of us would like to take observations around a few coal trains. Does anyone know how frequently they pass through Seattle (I believe they are only full northbound)? Are there more on certain days of the week? Is there any way to know when one is coming a hour or so ahead of time? Perhaps one of you living near a rail line might have some insights into this. 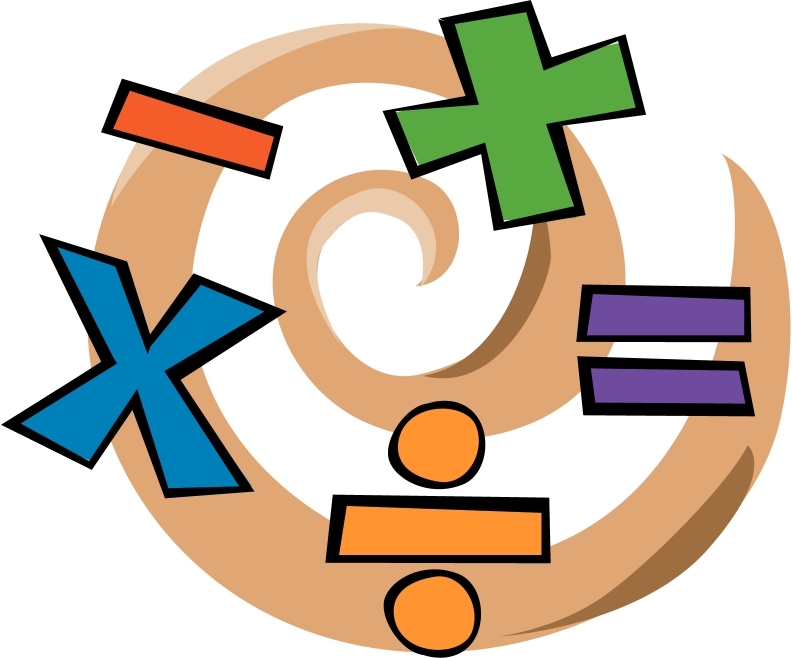 Check out my new blog on math curriculum here. A few days ago the Seattle Times ran another story on the math problems in Seattle, noting that about 70% of the students entered Seattle community colleges require math remediation. Now these are college-bound students that are unprepared...what about those that don't go to college or who drop out? I bet their math skills are no better. Or a lot worse. So we have a real disaster on our hands here in Seattle, and both students and parents in the district should be concerned. I mean very concerned. Now the article goes on to talk about a grant from the Gates foundation in which Seattle students were able to to rapidly advance to readiness for college-level classes after they were given an intense course in the basics they never learned or forgot. Yep...they needed to be taught how to do very basic stuff: fractions, percentages, orders of operations. Key skills they never learned in elementary and middle school. I even see these gaps in students entering the UW (I have given a math pretest in Atmospheric Sciences 101). We are not even talking about algebra, which requires knowledge of these basic operations. Folks, this situation is disgraceful and needs to be fixed immediately...and we have a good idea of why it is happening and how to improve the situation immensely. As I have noted in earlier blogs, the Seattle Public Schools has maintained the trifecta of terrible math curricula that use the discovery approach to instruction, while minimizing basic skills. We are talking about Everyday Math in elementary, Connected Math for middle schools, Discovering Math in the high schools. These books do not encourage mastery of the key mathematical skills. They push group work, essays about math, heavy calculator use, and spend inordinate time on extraneous topics (such as fractals and projections). We KNOW this curriculum is a big part of the problem for a number of reasons. For example, they don't contain a lot of crucial material...you can't learn what you aren't taught. And when a limited number of Seattle schools were able to use good math books (Singapore or Saxon) their math scores soared. You may have heard about Mercer Middle School--where rising math scores occurred quickly when they dropped the poor discovery texts (see story in the Seattle Times). I can give you several other examples of this effect, such as North Beach elementary when the switched to Saxon. So there can be a rapid and significant improvement in math performance in Seattle Public Schools by switching math curriculum. Some of the students have been so crippled by the poor curriculum of the past that they will need help to catch up...but we need to start...now. The time for excuses are over and changes in the district make a new beginning possible. First, Superintendent susan Enfield is leaving...a huge relief. As Chief Academic Officer and as acting Superintendent she supported and defended discovery math curricula and worked against letting individual schools test other approaches. I really worry what is going to happen in Highline. 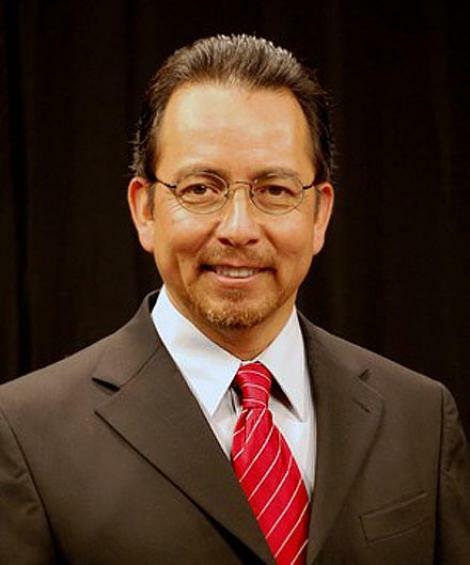 Next, our new Superintendent, Jose Banda, supported good math curricula in the Anaheim public schools, and seems like an individual that listens and makes rational decisions. Third, after last November's election there is probably a majority of the Seattle school board that would support fixing the math debacle. Fourth, there is now huge body of evidence that the current math curricula is a disaster and that bringing in better books (e.g, Singapore, Saxon) would have huge benefits. Fifth, the district's overall curriculum director and math/science lead have resigned. They have not been helpful--I met with them and came away disappointed. And there are more reasons for optimism: new approaches to computer learning promise powerful tools for giving students intensive practice in basic math skills. (1) The discovery math fanatics who still support it, even after its universal failures, because they believe it is better for the underprivileged (the opposite is true by the way) and for other equally irrational reasons. Schools of education are full of these confused folks, especially the UW College of Education. (2) The "corporate" education folks (Seattle Times--particularly Editorial writer Lynn Varner, League of Education Voters, Alliance for Education, Gates Foundation, Cross Cut, etc) who believe that charter schools are the answer, or in breaking the "power" of teacher's unions, or in using Teach for America minimally trained (few weeks) student teachers. In fact, most of this group is on the dole of the Gates Foundation, which has played a very unhealthy and undemocratic role in all of this. Ignore them..they have no idea what they are talking about and often have other agendas. The tragedy is that many of these groups mean well, but are doing substantial harm to the kids they mean to help. And some of the status quo types will say there is no money for books. Nonsense. Many parents will be pleased to buy a book for their kids to salvage their education. The district has some money put aside for new books. Many of us are willing to help finance the change. And ask the deep-pocketed Gates Foundation, an organization that just spent 3 million dollars on remediation according to the article cited above. Better new books than paying for endless remediation to fix the damage the old books caused. Don't get me wrong, although we can make major progress with a curriculum change there will still be issues. Undertrained teachers (also fixable), the effects of poverty and family dysfunction (much harder), and district bureaucratic intransigence and red tape. Bottom line: The poor math education we have given Seattle School District students is disgraceful. By leaving it in place we have prevented many district students from pursuing technical or vocational careers (yes, carpenters need to know fractions). We can make huge improvements with the simple act of changing the curriculum. New district leadership can allow a new direction. Isn't it FINALLY time to fix this? If you are a parent of a Seattle district student, you should talk to your principal and school board member. Bring it up at PTA meetings. If they tell you that they know better, keep pushing. They don't. The air temperatures are warming over northern California. The same with southern Oregon. But something awfully strange is happening with the temperature of the Pacific Ocean off of both of them--it is generally cooling as we trend towards summer. And this is normal. Why in the world would ocean temperatures get cooler during summer? 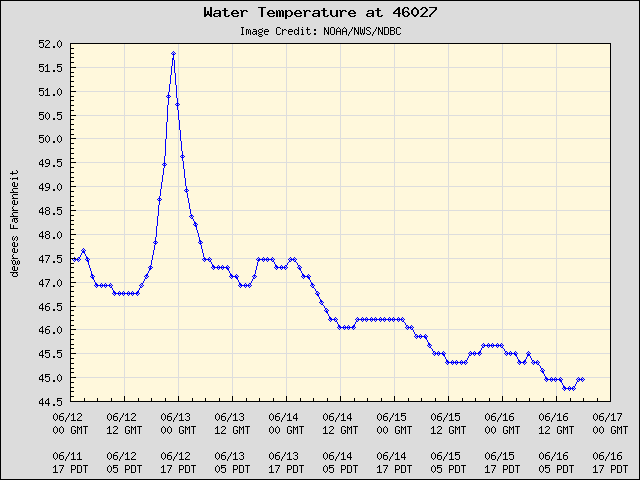 First, take a look at the sea surface temperature at Buoy 27, just off the CA/OR border. 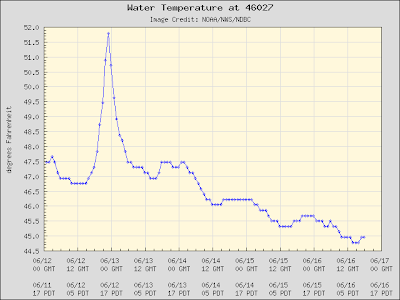 A cooling trend from roughly 47.5F to 45F...wow, the water is cold there. And there is a strange jump in temperature to 52F for a short period on June12th and 13th. Here is a plot of Pacific water temperature, with dark blue being the coldest: cold water is found along the coast. Very strange! The reason for this coastal cold water and the cooling during the summer is upwelling....cold water coming up from below in the coastal zone. Strangely enough, this upwelling is forced by our summer weather pattern in which high pressure builds offshore--with this high pressure producing northerly (from the north) flow along the coast. The northerlies are further strengthened by the warming of the interior and the resulting lower pressure (warm air is less dense). You note the very large difference in pressure over northern CA and southern Oregon. Now lets see if we can prove this is happening. 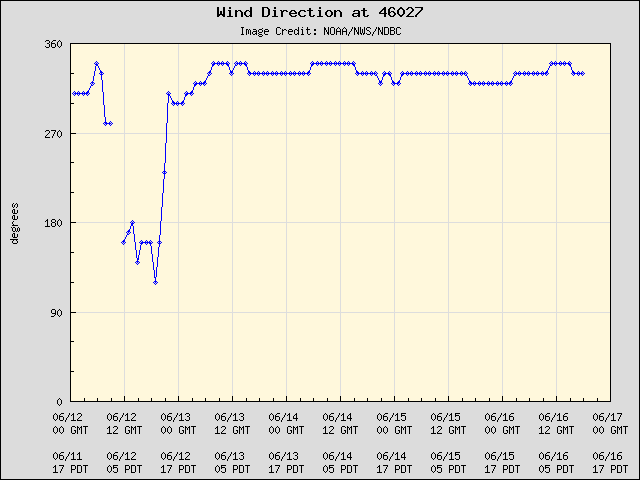 Here is a plot of the wind direction at Buoy 27....360 or 0 is north, 180 is south, 200 is NW...you get the picture. 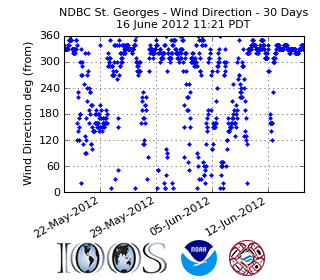 From mid-May until early June the winds were all over the place, but recently they have pretty much stuck with NNW. Here is a blow-up of the last week...north-northwesterly all the time except a short period of southerly winds on June 12th and 13th...exactly when we had the spike up of temperature. During southerly flow the upwelling fails..in fact, you can get downwelling...which is associated with warmer temperatures. Seems a bit humid? More like the East Coast in summer than our normally low relative humidity? The dew points...a good measure of the moisture in the air...are quite high today, reaching into the lower to mid 60s right now (around 2 PM Saturday). Here are the current dew points at some local stations--no lack of 60s! No wondering I am sweating so much while I am working in my garden today! Typical dew points around here in the spring and early summer are more typically in the mid 40s. Lets illustrate with Olympia, where the dew point is now 63F. This plot shows the dew points for the past 12 weeks. Today is highest, with one time in early June getting to 62. You can see the "atmospheric river" of moisture approaching us from the southwest. Tomato plants love this kind of weather. Time to break the bad news to my tomato plants.